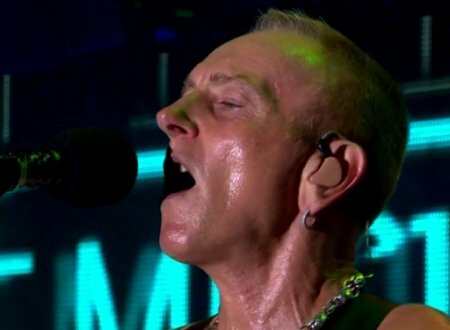 Def Leppard guitarist Phil Collen was recently interviewed about the Hysteria album's 30th anniversary. Phil spoke to Henry Yates of Music Radar to promote the new Hysteria 30th Anniversary Edition release. This interview was first published in the October 2017 issue of Guitarist magazine. Phil talked about the Hysteria album's writing/recording, band tragedies, approach on the album, his guitar playing/technique/equipment, Steve Clark's playing/their friendship/guitar partnership, guitar riffs, guitar tone, chart success/tour, Steve's death and the legacy of the album 30 years on. "I think it’s the best thing we ever did. It was our commercial and creative zenith. Most of the credit goes to Mutt Lange [producer], because he really pushed us to do something different. The first thing he said was, ‘We can’t make ‘Pyromania 2’, because every other rock band in the world is doing that. We’ve got to dig a bit deeper, and it’s gonna be a lot of hard work." "Me and Steve Clark did the opposite. We were trying to develop this harmony chord thing. We’d be muting the strings and we’d have a counter-rhythm and counter-melody going off. Lots of different things. Gods Of War had five different sections and hit every note on the fretboard. On the song Hysteria, there’s probably eight guitar parts going off at the same time on the chorus. Maybe even more. Not to be gratuitous, but to add something to it." "No, not really. Well, more so now. Especially when you have guitar geniuses like Joe Satriani, Paul Gilbert, Steve Vai and Brian May actually saying to you, ‘That is amazing guitar work.’ Y’know, Prince has mentioned it, Stevie Wonder has mentioned it. Alice Cooper actually said to me, ‘Whenever I go into the studio, I throw Hysteria on, just to hear how the room sounds."